LOCATION.--Lat 39°23'01", long 75°21'01" referenced to North American Datum of 1983, Greenwich Township, Cumberland County, NJ, Hydrologic Unit 02040206, on private pier at Greenwich Marina, 1,100 ft upstream of Pine Mount Creek, 0.7 mi southwest of Greenwich, 4.4 mi upstream of mouth and Delaware Bay, and 6.9 mi southwest of Bridgeton. PERIOD OF RECORD.--Annual maximum tide, water year 1979-2001. Unpublished fragmentary gage-height record, Oct 28, 1996 to Apr 27, 2000. Continuous-record tide gage, Apr 28, 2000 to current year. 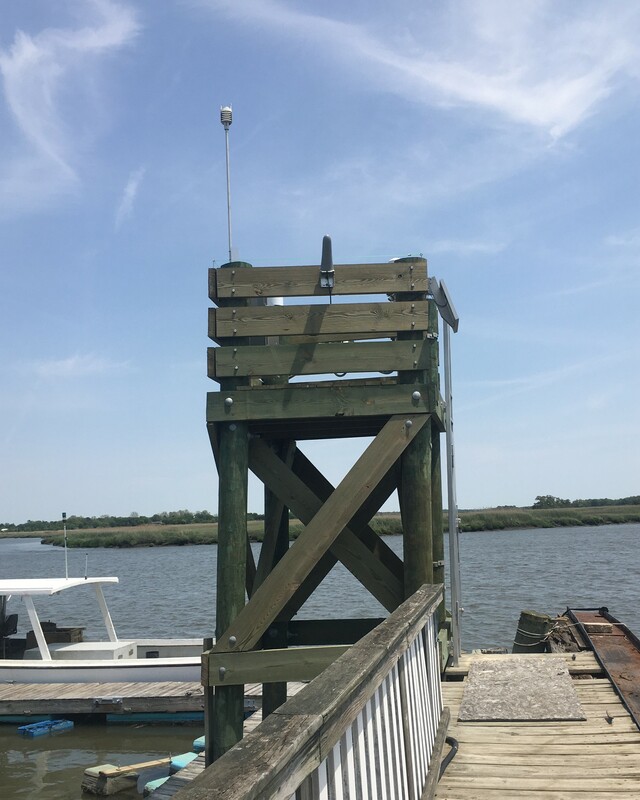 GAGE.--Tide elevation, water temperature and precipitation recorder with telemetry and tidal crest-stage gage. Datum of gage is at 0.00 ft NAVD of 1988. To determine approximate elevations to NGVD of 1929, add 1.34 ft. From October 1979 to September 2001, crest-stage gage located at current location (Greenwich Pier) and datum of gage at 0.00 ft NGVD of 1929. From September 2001 to January 2011, tide gage was located 0.5 mi downstream at Hancock Marina and datum of gage at 0.00 ft NAVD of 1988. Data published to NGVD of 1929 can be adjusted to NAVD of 1988 by subtracting 1.20 ft. Online annual tidal peaks have been adjusted to present datum. REMARKS.--Gage cannot measure tide elevation below approximately -3.15 ft. Tide elevations below -3.15 ft have been estimated. Periods of missing data are noted by dashed (---) lines. EXTREMES FOR PERIOD OF RECORD.--Maximum elevation, 5.99 ft, adjusted to present datum, Oct 25, 1980; minimum elevation, estimated, -6.9 ft, Mar 6, 2007, although a lower tide likely occurred during period of partially missing record on Feb 17, 2007 (elevation could not be accurately estimated). EXTREMES OUTSIDE PERIOD OF RECORD.--Maximum elevation known, 7.5 ft, adjusted to present datum, Nov 25, 1950, from high-water mark reported by the U.S. Army Corps of Engineers. National Weather Service flood stage for this gage is 7 ft. Rain gage data are available from this location at this link.